Chinese martial arts in Canada. To pass on the knowledge of traditional kung fu. Located in the Spadina/Dundas Chinatown, the club has grown from an initial 20 associates to well over 1,000 members. Sifu Chan and his students continue to practice the Choi Lee Fut and Do Pi systems of traditional kung fu, and the curriculum also includes Hei Gong (energy training), San Shou (sparring), and Lion Dance. The club's sustained philanthropic and community involvement has brought martial arts and Lion Dance performances to many events over the years. 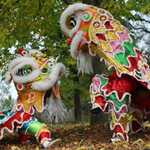 From charity fundraisers to private parties and from multicultural celebrations to Chinese-Canadian festivals, Hong Luck has established a legacy of excitement through spectacular displays of ancient traditions. The Lion Dance, in particular, is both an important, celebrated symbol of Chinese culture and Hong Luck's public image; traditionally, the lion is said to represent the spirit of a kung fu club. Hong Luck's lion dancers may be seen parading down local streets on such occasions as Chinese New Year and the club's anniversary but members of the Chinese community also contract them for functions such as weddings, anniversaries and store openings. In these types of events, there is a symbolic function attributed to the Lion Dance, a function that differentiates them from performances geared purely towards entertainment. Traditionally, the fearsome aspect of the lion and the loud, raucous music of its accompanying drum, gong and cymbals were thought to drive away evil spirits and bring good luck. In modern times, the literal belief in old superstitions may have been attenuated but the Lion Dance remains an important and auspicious ritual requiring some very specific protocols and etiquette. Before and after dancing, the lion must perform three bows as a sign of respect for its audience. Should the dance occur in a place with an altar, a further nine bows are required in front of it to honour ancestral traditions. Another important feature of traditional Lion Dancing is the eating of a green vegetable and the subsequent spitting back of the broken up leaves. The words for 'green' and 'money' sound similar in Chinese and so the action suggests spreading good fortune. Real lions never existed in China but records of Lion Dancing date back to the Tang Dynasty (CE 618-907). The style practised at Hong Luck is the symbolic Southern Lion (as compared to the theatrical Northern Lion) and features a fanciful head complete with a horn adorned with a red ribbon, forehead mirror, and movable eyes, ears and mouth. A sort of cape extends from the head and forms the body of the lion by draping over a second dancer. The person playing the tail is mostly bent over and follows the person playing the head but may also be called on to lift up their partner. Lions come in a three main colour schemes, each associated with a hero from Chinese legend and symbolizing their characteristics: wise, old General Liu Bei (gold and multicoloured); virtuous and noble General Kwan Kung (red and black); and strong, brave General Chang Fei (black, green, and white).